A couple of weeks ago at work, we had this AMAZING pesto crusted salmon left over from a meeting. I have wanted to recreate the recipe ever since, and decided to give it a try with tilapia. Cover a baking sheet with foil and coat with non-stick cooking spray. 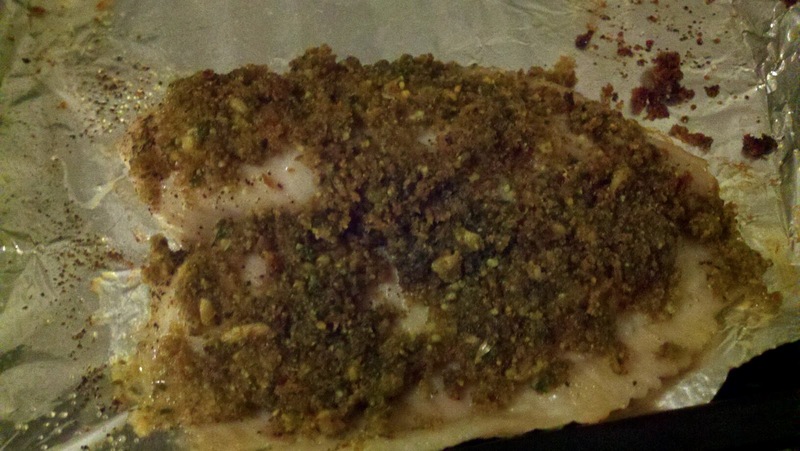 Place fish fillets on baking sheet and sprinkle with black pepper. No salt is needed as pesto and parmesan cheese are both pretty salty. In a small bowl, combine pesto, breadcrumbs, and parmesan cheese (hands or a fork will do). Divide the topping evenly over the fish fillets, spreading with your fingers and pressing into the fish. Bake for 10 minutes, then switch to broil to crisp up the crust for the last 2-5 minutes. If the middle of the fillet flakes with a fork and is completely opaque, it's time to dig in! Serve with steamed broccoli and brown rice pilaf for a healthy dinner. Recipe for Rice Pilaf (kind of) to follow in a later post! I'm a Penn State alum, a lover of all things artsy and craftsy, and a chef at heart.